Experience some of the best art in the city without stepping in a museum. It's confession time. As much as we love art, sometimes when we travel we put off going to museums until the end of our trip, vowing to fit them in on the first rainy day. Regularly we end up leaving a city with a few cultural to-do's still on our list, and a bitter sting of regret for not being culturally sophisticated to prioritize these important experiences. It's not that we don't love art, it's actually quite the opposite, we love art. The problem is that some museums can be, well… a bit clinical and quiet for our liking. When the weather is perfect and you want to explore, it almost seems a shame to be inside. The good news is you don't have to be couped up to get a taste of London's culture, you just need to take a walk. Best part is it's totally free. So in an effort to get some culture after a long week of shopping it was up early in the morning to catch the busy London streets at their quietest, and a exploration jaunt through the cities East End—arguably the best place to see great London street art. Check out Shoreditch and Hackney for amazing work, and if you happen to be a bit more central make your way to Leake Street Tunnel in Southwark. Leake Street Tunnel is an underpass that is covered in art, this tunnel is where the city's graffiti and street artists come to hone their craft. From day to day you can find new work springing up, so it's never really the same show twice. Here are a few highlights from our East End walk, although this is just the tip of the iceberg. 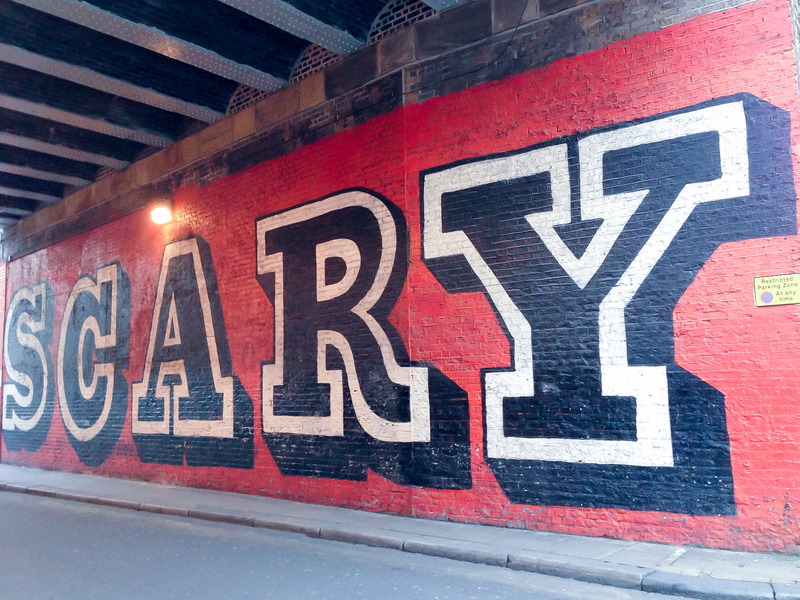 Head over to Rivington Street where you'll hardly be able to miss the enormous Ben Eine wall mural. If you want to see more of this artist take a trip to 'alphabet street' (Middlesex Street) in the wee hours of the morning when all the shops are closed and you'll get to catch a glimpse of his oversized, brightly colored letter painted on the doors and shutters down the entire street. His typographic street art style is beloved by locals and he's since had the opportunity to paint his letters in other major cities like Tokyo, L.A., and Paris. 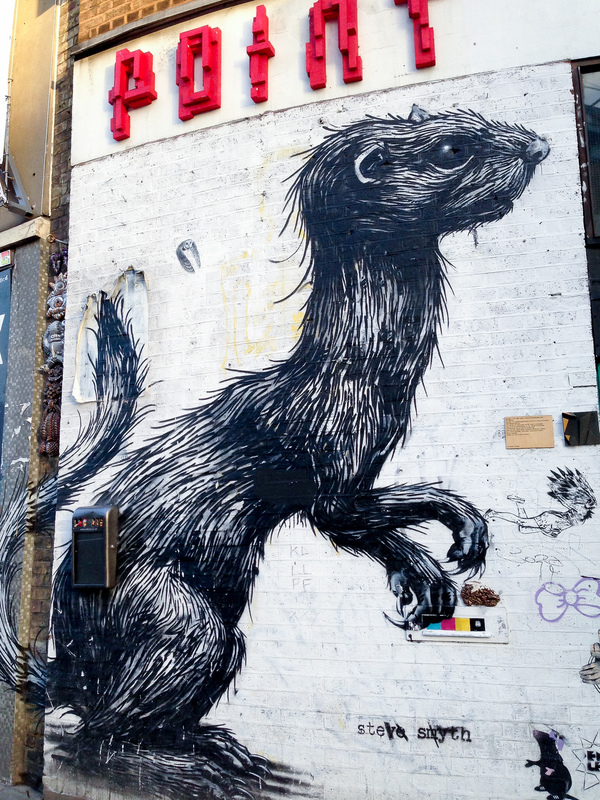 Roa is a Belgian artist who has gained local and international love for his striking giant animal art. His work is pretty realistic, and the sheer size is surprising when you turn the corner and see a T-rex sized rat on the side of a building. Check out this amazing time lapse video of him painting a mural, and be sure to keep a look out for his birds and rodents on the London streets. Another popular name in the street art world is Phlegm, an artist with a distinctly illustrative style who brings his imagination to life with his black and white art. The detail in his work is crazy, and it's not until you get up really close that you can see the complext line work involved. 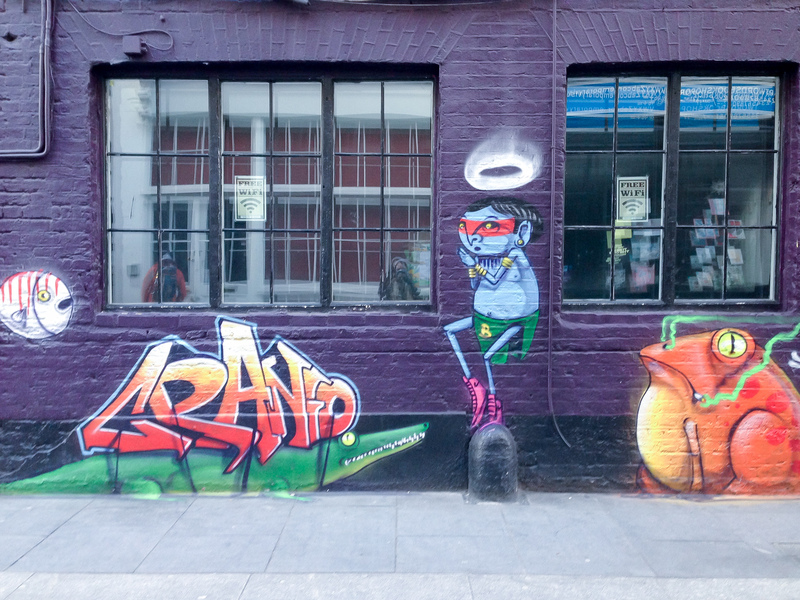 Malark is a proper London bloke and an artists who paints characters in vivid color that can't be missed. He clearly loves his childhood and wants to inspire the dark streets of London with something fun and a bit over the top. You'll find his work in the East End and throughout Brick Lane. 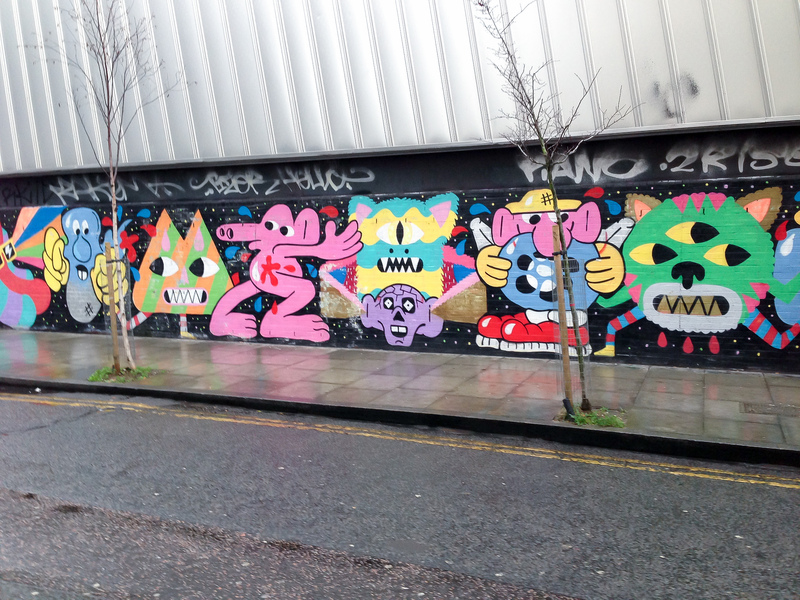 Another artists injecting some color on London's wall is Brazilian born Cranio. His blue figures dressed in neon outfits are often in communicating larger global issues. So there you have it, take a walk explore the urban cityscape and experience art in the open air. 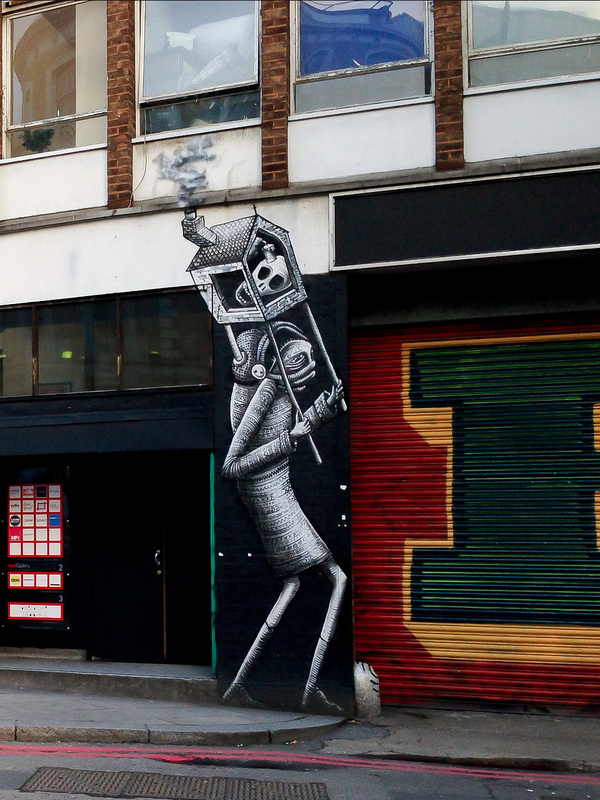 But if just stumbling around exploring dark ally ways isn't really your thing, you can always try one of the street art tours such as Alternative London walking tour. This tour is about 2 hours long and will take you through the East End to uncover some serious street art, and give you some inside tips on the artists. The tour is pay what you can (awesome) so even if you're on a tight budget you can afford to soak in some culture. London is famous for its street art and so many of the artists that show their work on these walls have become household names for their clever and candid pieces—yeah, we're looking at you Banksy. But these famous street artists aren't the only ones making the streets a better place. You'll also find hundreds of lesser known graffiti artists, painters, stencilers, and sticker-bombers popping up to make their mark. So don't just hunt down the famous works, take some time to stop and smell the spray paint and get to know some of London's emerging talent too.